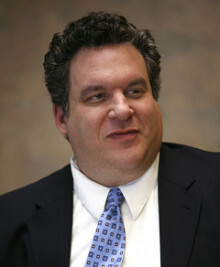 Jeff Garlin’s talent encompasses writing, producing, directing, acting and performing stand-up comedy. Garlin is co-star and executive producer of the HBO series “Curb Your Enthusiasm.” Raised in Chicago and then South Florida, Garlin studied filmmaking and began performing stand-up comedy while at the University of Miami. He has toured the country as a stand-up comedian, is an alumnus of Chicago’s Second City Theatre, and has written and starred in three critically acclaimed solo shows (“I Want Someone to Eat Cheese With,” “Uncomplicated” and “Concentrated”). Jeff released his book, “Curbing It” (Simon & Schuster) where Garlin shares his hysterical and eye-opening journey to reduce his waistline and his carbon footprint during the production of the seventh season of HBO’s “Curb Your Enthusiasm.” Currently, Garlin is on a fall comedy tour and has a local show based in Los Angeles at Largo called “By the Way – Conversations With.” Guests have included Michael Moore, Larry David, Conan O’Brian, Zach Galifianakis, J.J. Abrams, Lena Dunham, and Jeff Tweedy to name a few. Jeff works with Michael Moore as co-founder of the Traverse City Comedy Arts Festival, occurring annually in Michigan. In summer 2012, Jeff directed his second feature film, which he wrote and stars in. The film, “dealin’ with idiots,” was released in summer 2013. Garlin currently stars in “The Goldbergs” on ABC. Garlin lives in Los Angeles and Chicago with his wife and two sons. His hobbies include napping. Do you want to hire Jeff Garlin? Directly request a quote. In 48 hours we can send you the availability of Jeff Garlin If you would like to book Jeff Garlin, Entertainment Booking Agency is the right place. We will offer you the best price and contact the management or we directly contact Jeff Garlin. For corporate appearances or speaking engagements you can contact our agents and the will help you true the process. Tags: hire Jeff Garlin, Jeff Garlin booking, book Jeff Garlin, Jeff Garlin appearances, find more information on booking Jeff Garlin for appearances, Jeff Garlin speaking engagements, Jeff Garlin endorsements/spokesperson, Jeff Garlin appearance fees, Jeff Garlin booking agency contact info, biography of Jeff Garlin, Contact an artist booking talent agent find a speakers bureau that can book Jeff Garlin, speaker booking agency for Jeff Garlin, Jeff Garlin booking agency, Jeff Garlin booking for corporate event. EBA is one of the biggest entertainment booking agencies in the World. We book hundreds of celebrities, artist, athletes and speakers in a year. Important to know is that we are not claiming to be the management of Jeff Garlin. We are not the official agent for Jeff Garlin. Companies from around the globe book these artists and speakers true our company be course we have one of the biggest networks and we always have direct contact with the artist or the management. We help you to find the right celebrities for your corporate of private events. Please contact one of our agents to get free advice and we will help to get the world-famous artist on your party.